Our go-to plans for businesses taking flight and experiencing increases in call volume. Plan options for businesses with clients & potential customers that require more robust solutions. If you need more options, talk to us today about our custom plans. Try our live answering service free for 7 days, and get back to focusing on your business. Examples of these “a la carte” fees you can expect from other live answering companies are services like taking appointments, charging you for each call transfer/dispatch, charging a per minute fee for the entire time a patched call lasts, order taking, paging, voicemail, holiday or weekend fees, receiving faxes and even charging to send your messages to you any way other than email. With VoiceNation, there are no surprises. Once your order is processed, you will receive an email with a link to your online setup wizard. As soon as you complete your setup wizard, we will start answering your calls. It’s that easy. All live answering accounts are billed in six second increments. We don’t round up to the next minute. Your per-minute overage charge will vary, depending on your plan. For additional price plan details, please visit our Options & Pricing page. What’s the difference between the $49 Message Only plan, and the other plans? 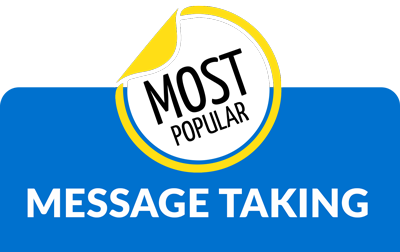 The Message Only plan was designed for anyone who just needs message taking. If you have more advanced needs, like call transferring or on-call dispatching, you will need a different plan. To see a list of all plans and features, please see our pricing page. Can I order a custom toll free or Vanity toll free number? Yes, VoiceNation can order custom toll free vanity numbers. Your custom vanity toll free number can be used as your free VoiceNation number that is included with your account. There is a one time charge of $75 to order a vanity toll free number. Vanity numbers are not available as local area code numbers, only toll free. To order a vanity number, search this site here or here and once you have found your number, proceed through the VoiceNation website ordering process. During the order there will be a field for you to enter your requested number. Please allow 5 business days for vanity numbers to be confirmed. We advise you not to advertise or give out your requested vanity number until we have emailed you to confirm your number has been reserved.